En-suite: shower, wash hand basin and WC. Family bathroom: bath with shower over, wash hand basin and WC. Kitchen and breakfast room: handmade painted kitchen with Smeg electric oven and gas hob, dishwasher, fridge, microwave and all the usual kitchen gadgets. Dining area to seat six with Sony TV. Outside: Parking & garden: to the front: gravelled parking for two cars. To the rear: large decked terraced with teak table and chairs. Gated stairs down to garden and outside shower. Outback gas BBQ and large storage shed. Utility Room: Utility Room: Washing machine, tumble dryer and freezer. Cleaning / Towels / Linen / Maid service: All beds have high quality feather & down filled duvets and pillows. Bed linen is provided along with a bath and hand towel. For every guest. For bookings of 2 weeks or more a change of bed linen is available. Two tea towels and two hand towels. Good location with off street parking, we were glad we only had one car with us though! Close to centre of St Ives (good workout for your calf muscles!). House was nice, some areas in need of a bit of an update, information book also needs updating - leaflets in there were from 2011!! Beautiful views out to sea, very nice to wake up to. We only used the house as a base, so only used kettle and toaster, but the kitchen was well equipped for people who prefer to eat in when they’re on holiday. Shower in bathroom was hot and powerful. Bedrooms are quite small, as there were only 4 of us, we used the room with bunk beds to keep our clothes/cases etc. All in all a nice property. We stayed at the house in St Ives in August 2018 for a week. We found the house to be immaculate and very well equipped. The garden is lovely and we used the BBQ too. Location is great - it is up a hill so would suit more able bodied people but the views are stunning and it is very quiet. The car parking is also fab, as St Ives is rather busy and parking is an issue. Really high quality house, we had no issues, except the house wasn't ready when we arrived after a long journey for an hour past the scheduled time. All in all a great family holiday and we would definitely stay again. The house is in an ideal location, having a real home from home feel. The house is immaculate and every little detail is thought of. We had a lovely holiday with great views! 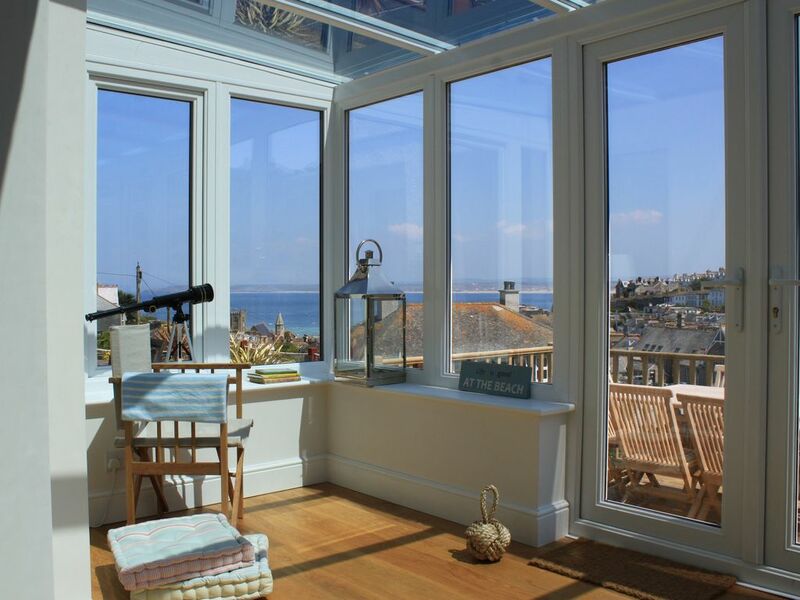 Lovely house with excellent view of St Ives. We stayed at Gwithians Reach last summer and fell in love with the place. We have booked to stay again this year. The house was spotless and beautifully presented, the facilities were of a very high standard and exceeded our expectations. The location is convienient for all the beaches and town centre. Communication with the owners was great and stress free! We can't wait to go back! Das Haus ist vollständig und sehr geschmackvoll, hell und liebevoll eingerichtet. In der Küche ist komplett alles was man braucht vorhanden. Der Blick auf das Meer uns St.Ives ist bei jedem Wetter wunderbar. Wir hatten eine sehr schöne und erholsame Woche verbracht. Da es ausserordentlich heiss war für England, verbrachten wir viel Zeit im Garten, dort hat uns ein Sonnenschirm gefehlt. Wir würden jederzeit wieder dieses Haus mieten. Herzlichen Dank den überaus freundlichen und hilfsbereiten Gastgebern und housekeeper! Gwithians Reach is located under 5 minutes walk to the beach. St. Ives is readily accessible by road, rail and air with Newquay airport approx 40 minutes drive away. By car: Take the M5 towards Exeter or Plymouth (take the A38 from Plymouth) join the A30 into Cornwall. By train: Paddington London (FGW) or Glasgow (Virgin) to Penzance, Alight at St Erth for St. Ives. Gwithians Reach is a short walk or 5 minute taxi ride from St. Ives Station. Our Terms & Conditions are available on our website www.gwithiansreach.co.uk and by request.with full details of our cancellation pollicy.